Potential theory is the broad area of mathematical analysis encompassing such topics as harmonic and subharmonic functions, the Dirichlet problem, harmonic measure, Green's functions, potentials and capacity. This is an introduction to the subject suitable for beginning graduate students, concentrating on the important case of two dimensions. This permits a simpler treatment than other books, yet is still sufficient for a wide range of applications to complex analysis; these include Picard's theorem, the Phragmen-Lindeloef principle, the Koebe one-quarter mapping theorem and a sharp quantitative form of Runge's theorem. 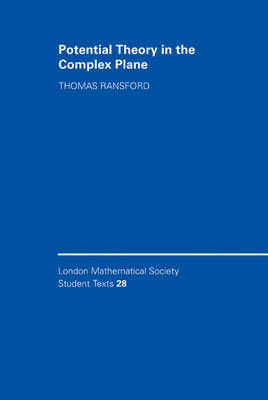 In addition there is a chapter on connections with functional analysis and dynamical systems, which shows how the theory can be applied to other parts of mathematics, and gives a flavour of some recent research. Exercises are provided throughout, enabling the book to be used with advanced courses on complex analysis or potential theory.